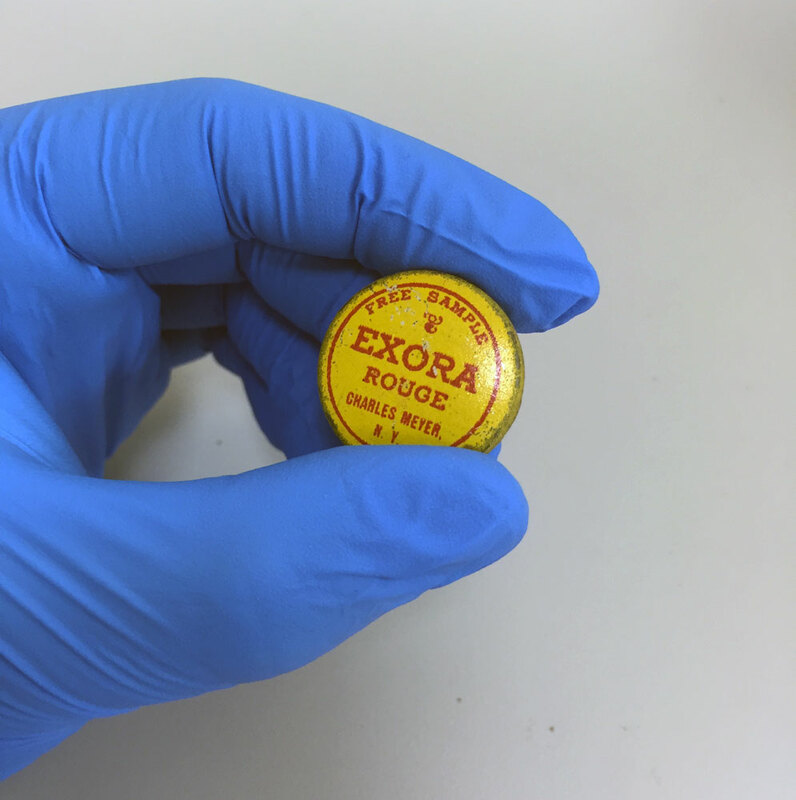 We currently have a small collection of late 19th and early 20th century cosmetic samples from our Advertising Ephemera Collection in the lab for stabilization and rehousing. The majority of the samples are little paper envelopes with loose powder inside, but one of them contained a fun little surprise. 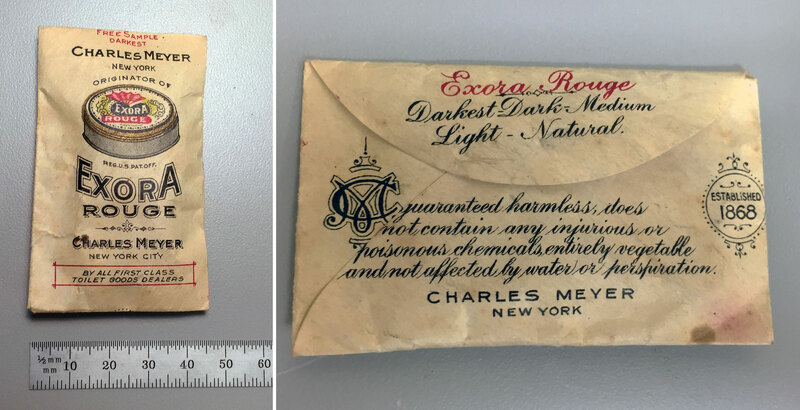 This sample of Charles Meyer Exora Rouge was quite a bit thicker than the others and I could feel a tiny, rigid container inside. The adhesive on the envelope flap was easily released and inside was the smallest tin I’ve ever seen. I don’t know exactly when this item was manufactured, but the bottom left of this page from a 1907 issue of the New York Clipper features an advertisement for free samples of Exora Rouge. Have you noticed that the most simple-seeming projects always turn out to be more complicated than you think? As part of our preparations to move our collections to our renovated library, we are trying to free up space in the flat files. 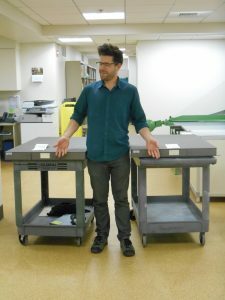 Our flat files contain broadsides, maps, posters, artwork, etc. Many of these items are large and flat and should be in the flat files. 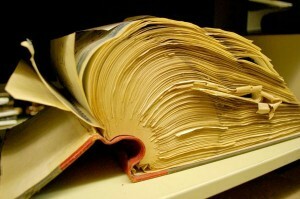 Many are flat but are small enough to fit into standard manuscript boxes or pamphlet binders. 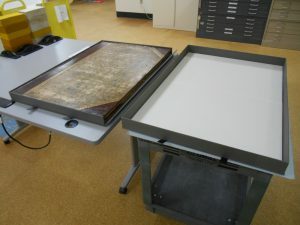 Last November we embarked on a project to help the Rubenstein Library move as many of the smaller maps as possible into enclosures to free up space in the flat files. Sounds easy, right? I am an advocate of NOT encapsulating materials unless it is necessary to facilitate handling. Polyester is expensive, and it can add a lot of weight to the stacks. 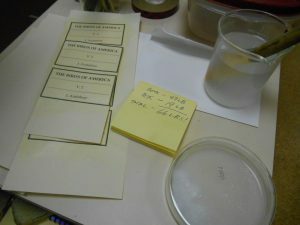 It can also make handling difficult for patrons as they sift through a stack of slippery encapsulated documents. 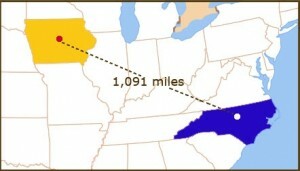 Many of these maps didn’t need to be encapsulated. They are in good condition and a folder inside a box would suffice. However, in order to finish the project by the move date, we would need to utilize our student assistants and our volunteer. 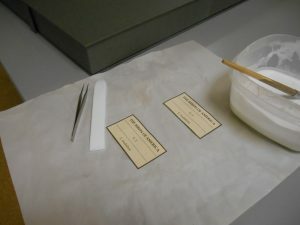 If we decided to de-encapsulate materials, it would mean a conservator would have to evaluate the condition of each item to determine its disposition. There simply wasn’t time to do this. In consultation with Rubenstein staff, we decided the maps would stay encapsulated in their old polyester if possible. We would replace the polyester only if an item didn’t fit its current encapsulation, or if the old polyester was too damaged to keep. Second Challenge: All That Tape! Almost all of the maps have been previously encapsulated using double stick tape to adhere the two pieces of polyester together. While this is a common method of encapsulation, it poses one big problem. A document can shift to the edge and become stuck. This poses a particular hazard for brittle materials. 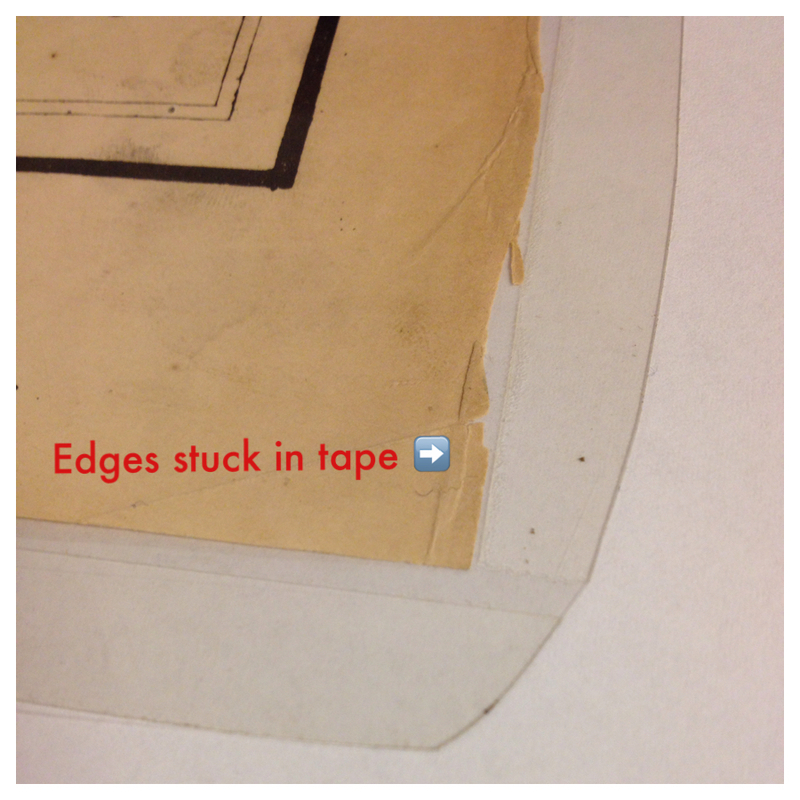 Lucky for us, most of our maps were encapsulated with a generous amount of space between the object and the tape. We decided that we could ultrasonically weld between the object and the tape, trim the tape off, and voila! A retrofitted encapsulation. Brittle map edge is stuck to the taped polyester sheets. As we looked through the thirty drawers of materials it became clear that some of the old encapsulations just weren’t working. There were several items that had encapsulations that were too small. Some large folded items were put still folded into an L-sleeve encapsulation. 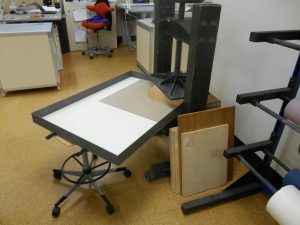 Handling is awkward, and unfolded these items became too large for either the manuscript boxes or the flat files. Rubenstein staff decided on two standard manuscript box sizes and two standard pamplet-binder sizes. Anything that could go into one of these would do so. Any folded item would be unfolded. 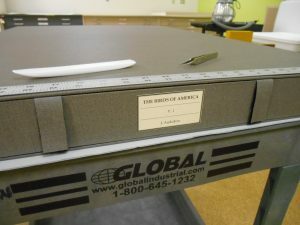 If an item was too big for a box, it would remain in a folder in a flat file. 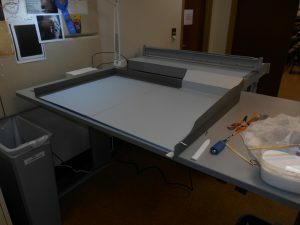 If it was too big to lay flat in the current flat files, we would wait to encapsulate it until we were in our new space with our new, bigger flat files. There are a few items that are in too bad of a condition to safely re-encapsulate. These will come to conservation for treatment first. 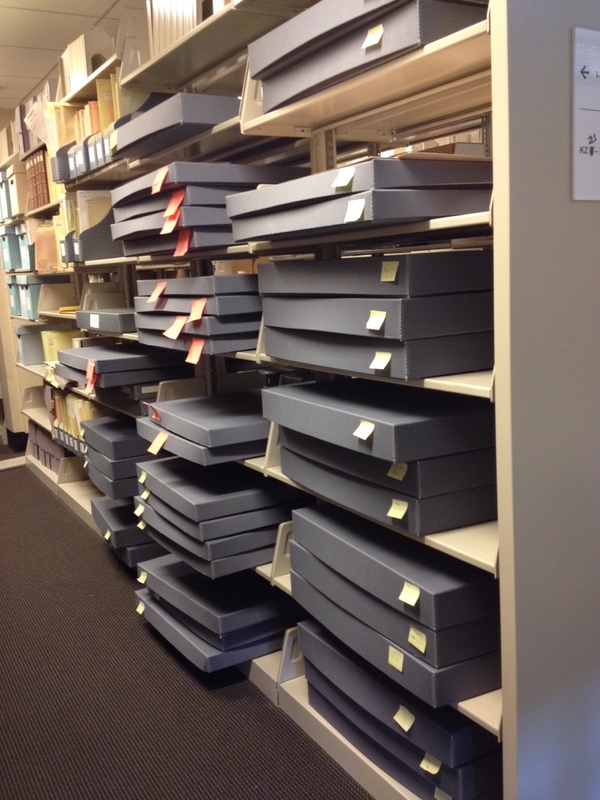 Maps in new manuscript boxes. There is a lot of weird stuff in libraries and not everything in the map drawers are maps. As we work our way through the map collection we are setting these oddities aside for curatorial review. Some will end up back in the flat files, some will be the responsibility of Collection Development to deal with. To date we have encapsulated 1,865 items. 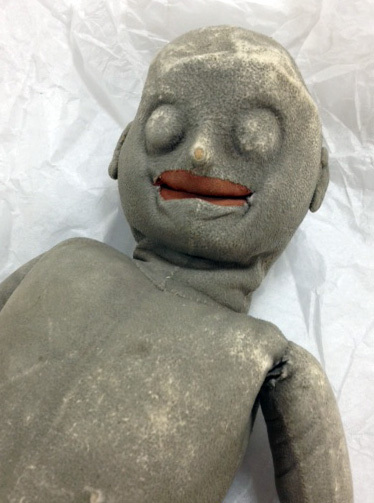 By our estimates we are about 90% finished, but what is left is some of the oddball items that need special attention by conservation, curators and by technical services. Technical services will also have to update the new locations, which they will do during the reclass project. Did I mention Rubenstein is also doing a huge reclass project during the move? We don’t believe in doing only one huge project at a time, that would be too easy. 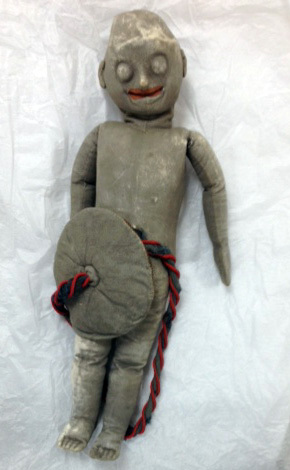 We got an amazing History of Medicine Collection artifact in the lab today for boxing . It is an anatomical birthing model dated to the 1890’s. The body and placenta are made of a soft suede material with red and blue yarn for the umbilical cord. The stitching that attaches each section to the main body is very finely done. I don’t know the complete history of this item. But judging by the attention to detail on the hands, feet, and ears, along with the elegant stitching, you can tell this was a lovingly-crafted model. Rachel unpacks some real gems from technical services. 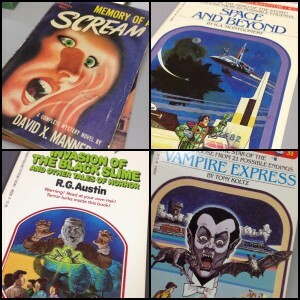 We love getting Boxing Day books from Rubenstein Library Technical Services, especially pulps from the 60’s, 70’s and 80’s. When you open the crate, you never know what you are going to get. Today the crate was filled with Horror! Fantasy! Choose your own adventure tales! All with some pretty amazing cover art. Happy Halloween! It’s been a while since we talked about the renovation project, mostly because of this. But yesterday I was working on a short video to explain how to make a “burrito” and was reflecting on why and how these came to be. Our renovation project came at us fast due to a major gift that allowed us to accelerate the renovation schedule. 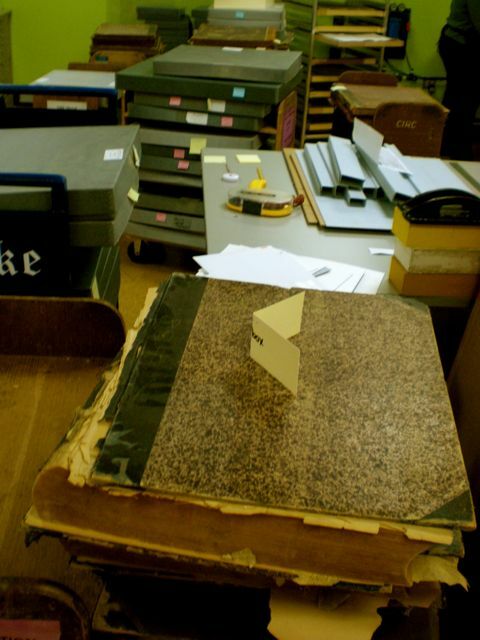 We had just over a year to plan and move the special collections stacks to make way for demolition. That is not a lot of time to move an entire library of rare, valuable and decidedly fragile materials. 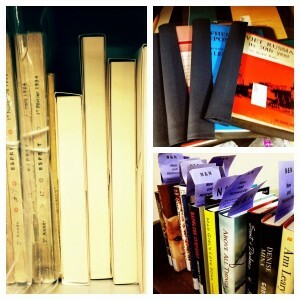 The library approached us with a problem. 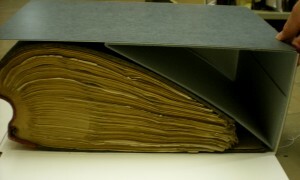 Many of the older flat archival boxes were too large for their contents. Staff were concerned that moving these off site would cause damage when the objects shifted around inside the boxes. Could we come up with a low cost, low tech, fast, anyone-can-do-it solution? These are made of buffered 10-point folder stock and tissue paper. They are non-adhesive, easy to make, fast and just about anyone could make them. 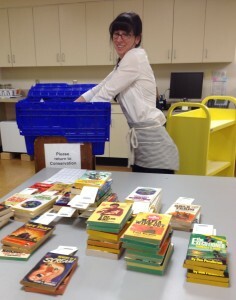 We pre-cut the folder stock to the standard box sizes and trained the Rubenstein staff to make the burritos. These are meant to be a temporary solution. However, I’ve seen some of these boxes come back and I have to say they are working pretty well. 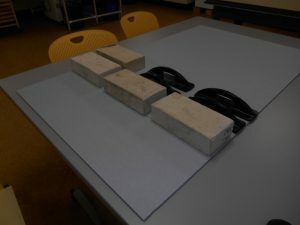 They aren’t as sturdy as a corrugated spacer, and some of them aren’t quite the right size for the space they were meant to fill, but for the most part they are doing what they were designed to do. I think it is a solution that works, and could be a good one for small institutions and organizations who may not have a lot of resources, or for anyone faced with a mountain of boxes that need spacers in a hurry. What do you think? Have you come up with a solution like this that you want to share? This month on the 1091 Project we discuss an essential part of almost every conservation department, student technicians. Without our students we could not keep up with the sheer amount of materials that come to the lab. This week is spring break, so I can’t show you pictures of our wonderful students, KellyNoel, Kaiti and Jessica (on loan from ERSM for a project), but I can tell you about the work they do and what we look for in a good student assistant. Student work, finished and in-process. 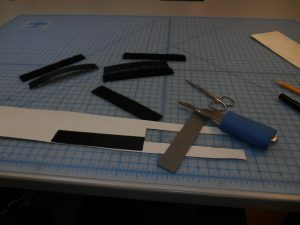 Our students start out learning how to bind pamphlets, make simple enclosures, create CoLibri book jackets, make pockets and do simple repairs such as tip ins, cut pages, and binding musical scores. 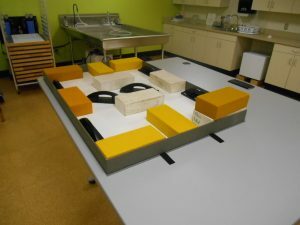 They also help with the tracking and physical moving of materials. If the students have the abilities and interest they can learn more complicated repairs and enclosures. These might include recasing or rebacking books, or making four-flap or corrugated clamshell boxes for fragile materials. 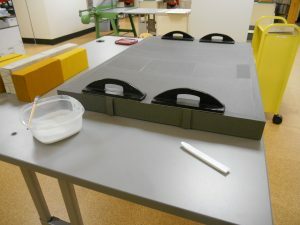 We have had a couple students who stayed for several semesters and because they had the skills and interest, they were able to learn multiple conservation rebinding techniques and cloth-covered clamshell boxes. We currently have students helping specifically with renovation projects. These students are primarily getting the newspapers ready to go to the Library Service Center. 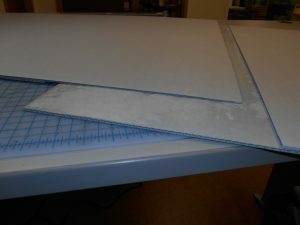 This involves jogging brittle paper into place, fitting the bindings into pre-made boxes, and making spacers in the boxes so the brittle papers don’t shift around during transit. This is a very labor intensive, dirty and repetitive project but all of our students are working hard to meet our fast approaching deadline. Most of our students are undergraduates, but every now and then we hire a graduate student. We of course like it if they have state or federal work study, but that isn’t a requirement. We prefer to get the right student with the right skills regardless of their funding. Occasionally we will get a UNC-SILS student who wants to intern with the department and we will work with them to develop a project that fulfills their school requirements but also helps us move our department forward. There are basic job requirements that are listed in all of our positions including being able to use sharp instruments and large binding equipment safely, lifting heavy boxes and moving full book trucks, and being able to work in a potentially dusty or moldy environment. Beyond that, what I look for when I interview students is the ability to learn quickly and be productive, to work independently but to know when to ask questions, and to have a good attitude and work well with a diverse staff. 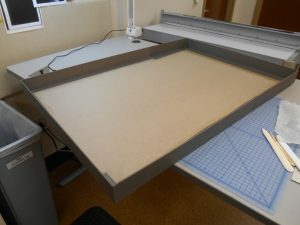 It is rare that we find students who have bookbinding experience, so I look for interests or past work history that involve eye-hand coordination and attention to detail. It might surprise you that gamers have very good eye-hand coordination, students with musical backgrounds are excellent at following instructions, and research science students are amazingly skilled at detail-oriented work. If you are a student, you don’t need to be a crafty person or an art major to work here. We can teach you the skills you need to be successful if you have the ability to learn the craft. 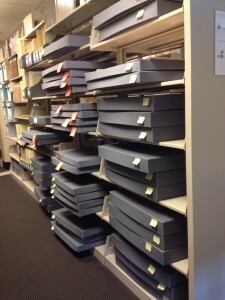 Let’s head over to Parks Library Preservation to read about their students. We are finding many challenges in preparing our materials for the upcoming move. Erin Hammeke, Special Collections Conservator, shares the following find from her work as the project coordinator for the ledger project. Stock ledger on the shelf. 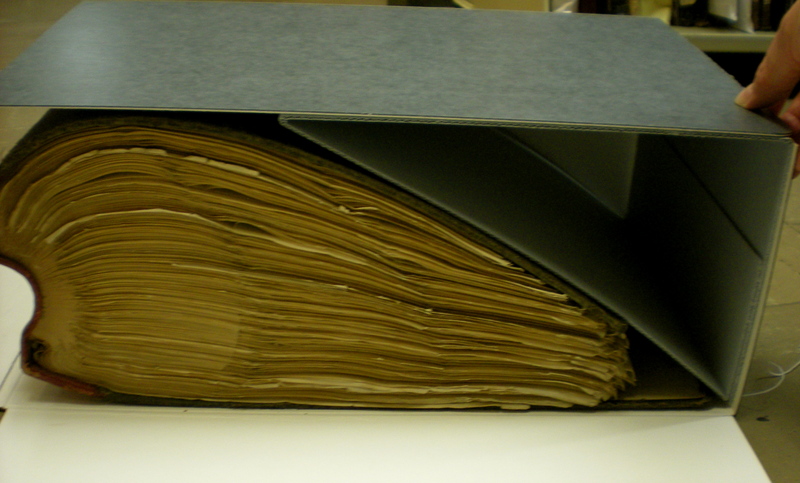 As part of the enabling project we are working in our ledger collection to prepare these materials for the move. The Mooresville Mill manufactured cotton, wool, and synthetic fabrics in Mooresville, North Carolina, from the late 19th century to the mid-20th. When the company’s stocks were sold back, they were cancelled and glued onto the stubs bound into a ledger book. The stock certificates were also glued in, leaving the book with a fore edge 2-3 times the thickness of the spine. We started calling these ‘swirl books’ because of their exceptional shape. These items really seem more akin to sculpture than book bindings. 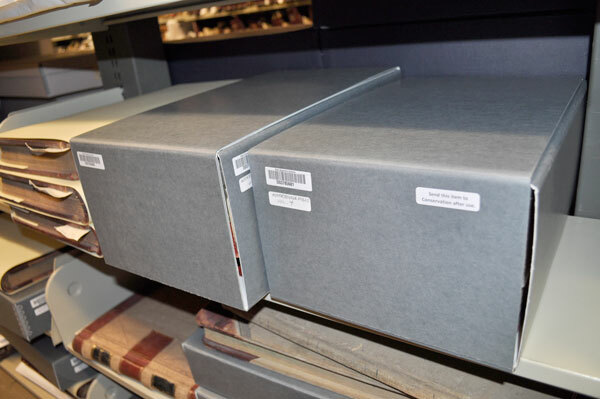 We consulted with the head of collection development in the Rubenstein Library and we agreed that treatment would be too time-consuming of an option before the move. We decided to house the swirl books as they were. Needless to say, these items posed unique shelving and housing challenges to us. Our technician, Tedd Anderson, bravely met the challenge. 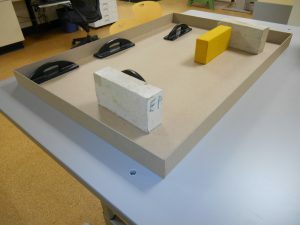 For each ledger, Tedd created a wedge to accommodate the shape of the original so that they would fit inside a custom phase box. They can now be shelved safely and are protected from further damage. 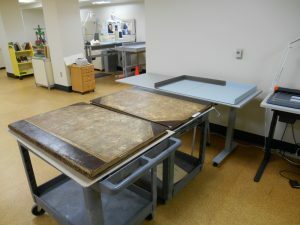 These will go in our conservation treatment request database for future treatment. 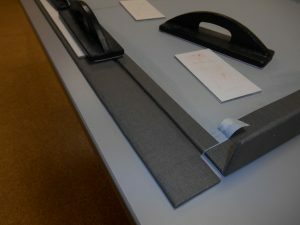 A wedge compensates for the shape of the ledger. Finished boxes on the shelf.